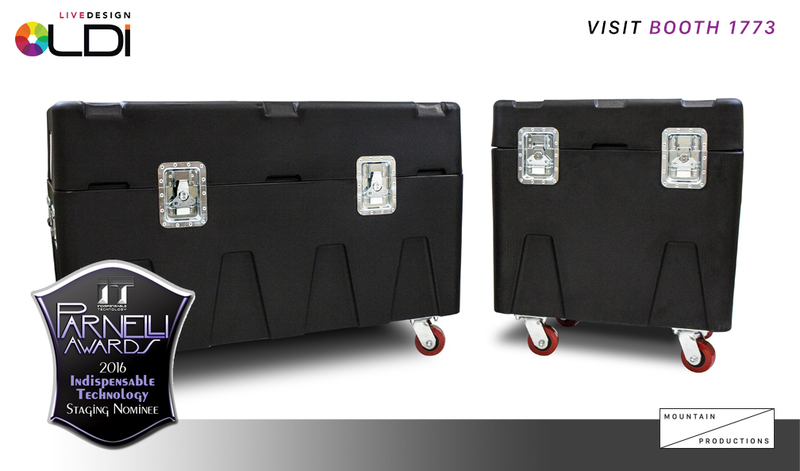 If you want some more information before LDI about the MTN BOX road cases, head on over to our website at www.mtnbox.com. At LDI, Marty Wesstrom, Director of Rigging Sales and project lead will be ready to meet with you and answer any and all of your questions about the most durable and versatile road case in the industry. (Click here to schedule an appointment with Marty). Some of the most popular items on our e-commerce store, Mountain Productions Rigging Shop, are our proprietary MTN Chain Hoist Bags. The MTN Chain Bag family includes chain hoist bags for Lodestars, Prostars, and manual chain hoists. We proudly manufacture these products at our campus in Pennsylvania and can custom fabricate bags for virtually any hoist. 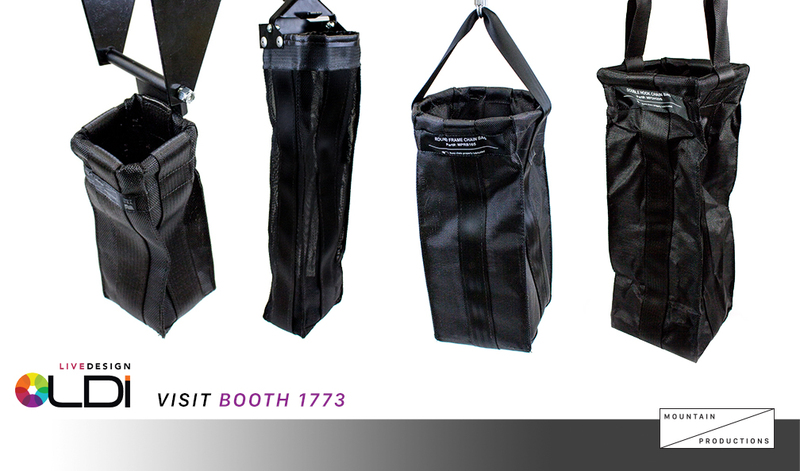 Our chain hoist bags are trusted by countless clients—stop by Booth 1773 to see for yourself, or take a quick look now at our chain hoist bag products here. Keith Ellis, Rigging Sales Consultant, can talk to you about what makes our chain bags so highly in demand, along with the wide range of rigging services Mountain can offer. 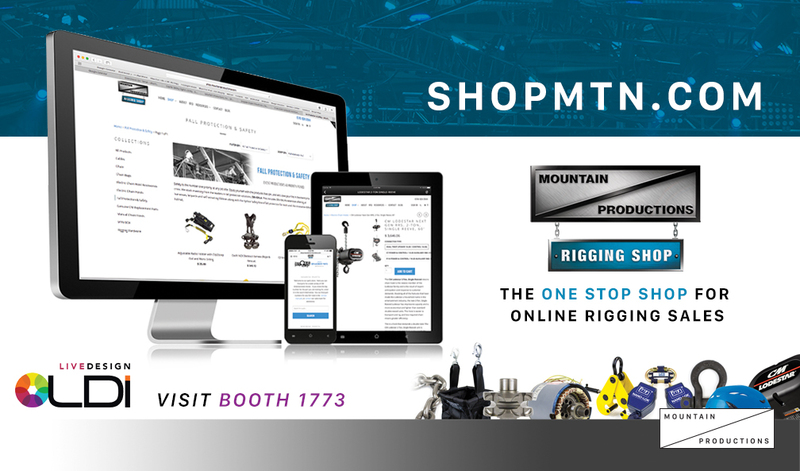 Since its creation, Mountain Productions Rigging Shop (shopmtn.com) has established itself as a trusted and efficient resource for production professionals all over the country for the best rigging equipment, hardware, fall protection gear, and much more. Our Rigging Shop is always growing with new product lines added. Looking for that Exofit NEX harness that all the guys on site have? We’ve got it. Need a more reliable measuring device than the old fashioned tape measurer? Leica DISTOs are your answer. Need a replacement transformer to get your shop’s Lodestar back to working order? Browse the most comprehensive collection of genuine CM replacement chain hoist parts online, with diagrams, pictures, and easily referenced part numbers—all on Mountain Productions Rigging Shop. 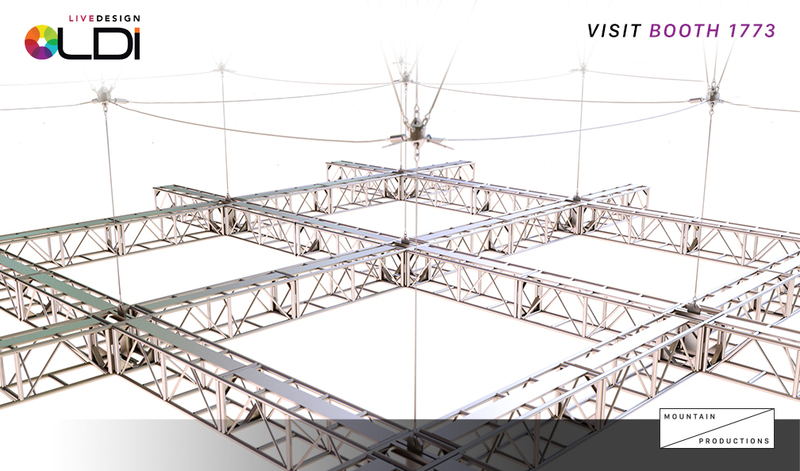 Venue managers will want to stop at our booth at LDI to learn more about our venue installation services. Dave Piccola, Director of Venue Installations, is ready to talk about the various systems, solutions, and ways that Mountain Productions can save you and your venue money, reduce labor costs, and increase your attendance. Dave has a wealth of knowledge in the installation market, and has lead hundreds of projects to completion that have truly improved venues all over the country. Book a meeting with Dave and start your venue’s transformation at LDI by clicking here. Staging is our bread and butter, and no other company is as experienced as the Mountain team when it comes to providing completely customizable stage systems. 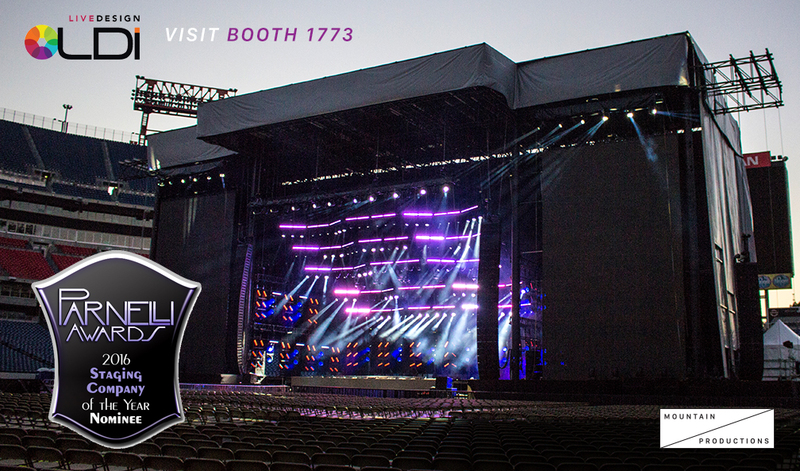 Bryan Ellis, our Director of Staging Sales, will be at LDI to discuss the various staging systems and services we provide, including the premier structures in entertainment, the MTN Truss family of staging systems. Mountain was nominated for another Parnelli in 2016 for our MTN Truss HD+ System at the CMA Music Awards and Festival. Read our recap of the event here. If you have an upcoming project or event that you’d like to discuss, or simply want to learn more about Mountain Productions’ staging services, schedule a meeting with Bryan today by clicking here. Mountain Productions is expanding with new Vibe and Film capabilities. At MTN Film we are passionate about storytelling and our creative team is there to craft the visual journey for your brand or event with pre-production, production, and post-production capabilities. Our Vibe MTN offering will create stunning scenic for events and creative conceptual development for the most unique and captivating brand activations. 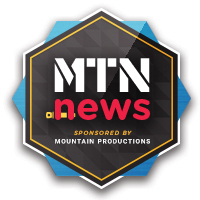 Learn more about Vibe MTN and MTN Film at LDI by stopping by Booth 1773 and talking with our CEO, Ricky Rose, about these exciting additions and our growth into the west coast market. This only begins to dive into the wide range of capabilities that Mountain Productions has to offer, and we’ll have it all on display with team members ready to discuss with you at LDI. We hope you can stop by, and rumor has it that we will have a handful of exclusive discount coupons for Mountain Productions Rigging Shop. Head over to Booth 1773 and meet your friends at Mountain Productions—we can’t wait to see you in Vegas! Interested in booking a half hour dedicated meeting with one of the Mountain team members? Click here to book a meeting with a Mountain Productions’ team member today and talk about your next project with an experienced production professional. You’ve invested your time and resources to get to Vegas, make sure you get what you came for. If you’re having trouble booking an appointment or have any questions, we’re always ready to take your call at 570 826 5566.